We use a case study to illustrate why gas storage asset variable costs are a key value driver. 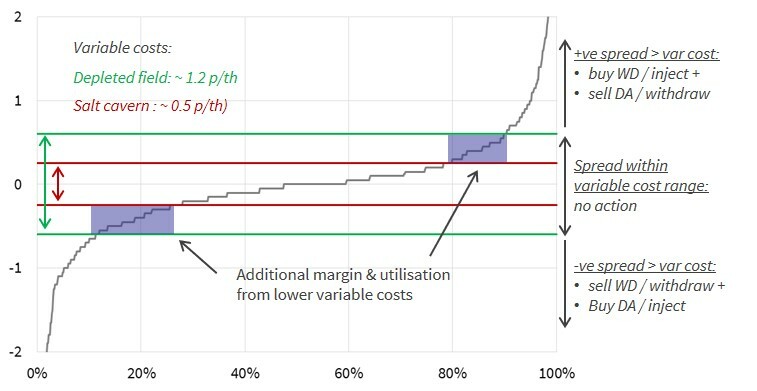 We also look at how costs can be optimised to increase value. Cycling performance – relative rates of injection and withdrawal. These headline attributes are definitely important in evaluating a storage asset. But there is another characteristic that often gets less attention than it deserves: variable cycling costs. Lower variable costs mean a lower hurdle to capture market price spreads. This translates directly into higher utilisation and higher expected returns on storage capacity. It also offers downside protection in a low seasonal spread environment (such as the last five years). For this reason, low cycling costs are a boon for traders and storage owners alike. The grey line shows the ranked NBP Day-Ahead to Within-Day price spread for across 2015-2018. For both storage facilities there are a range of lower spreads where no action is profitable i.e. where variable cycling costs exceed price spreads. But the ‘no action’ range for the fast cycle storage (red lines) is significantly smaller than for the depleted field (green lines). Lower cycling costs mean greater utilisation & cycling opportunities for the salt cavern facility. Lower costs also mean that the salt cavern captures a higher margin from spreads than the depleted field can capture. Both these dynamics help protect margins for assets with low cycling costs when operating in a low price spread environment. Asset design: For example, relative cavern pressure vs grid. Infrastructure: The age and configuration of facility infrastructure (e.g. compressors) can impact cycling efficiency/cost. Cavern type: For example, salt cavern variable costs are generally lower than for depleted fields. TSO charging structure: For example, German storage assets have historically had relatively high variable costs due to inclusion of D-A entry / exit capacity costs. These costs tend to be bundled into capacity products in UK/NL. There are currently EU wide and UK regulatory transmission charging reviews aiming to harmonise charging principles. There is ultimately a cost / benefit trade off for owners in optimising the variable costs of storage assets. Taking actions to reduce variable costs makes sense as long the incremental spend to achieve reductions is less than the risk adjusted market returns it yields. Storage asset owners have suffered several tough years of lower market returns. In this environment, optimising asset variable costs can be a key source of value upside.